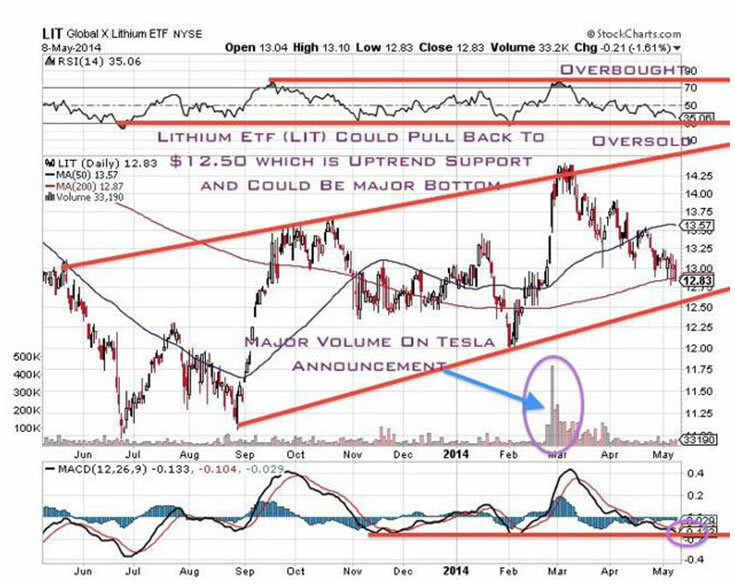 The correction in the lithium ETF may be an opportunity for long-term believers in the electrification of automobiles. Fundamentals are excellent as demand could double over the next 3-5 years for lithium ion batteries. In addition to electric cars, lithium ion batteries power our smartphones, tablets, laptops and smart grids. Tesla's announcement to build a factory in the Western US could be game changer for the lithium and graphite sectors. Lithium and Graphite miners, manufacturers and producers could rise in value exponentially. Despite the lithium sector being in a correction for six weeks, attention should be paid to this dynamic sector which may be just on the verge of breaking out higher. 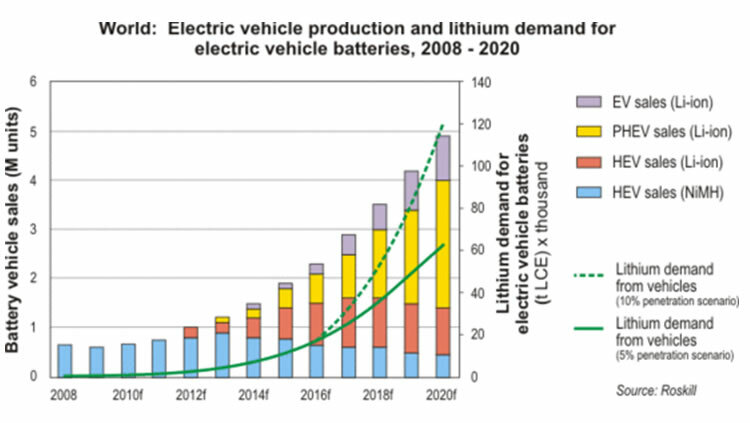 For years I alerted you ahead of the general public about the potential growth in the lithium-ion battery market needed for electric vehicles, grid storage and mobile electronics. From the chart above notice the huge volume which came in early March after the Tesla announcement. It has pulled back since that run which may provide long-term investors with a more prudent entry point. As you can see below Tesla is building electric vehicles which could compete against some of the top luxury cars. I was way ahead of my time forecasting the rebound in lithium and graphite miners as they are both critical materials for lithium-ion batteries needed in electric vehicles. Demand for these batteries could double over the next five years. I have remained bullish and have been waiting for a significant catalyst to turn this sector. Investors should consider a long-term investment in the Lithium ETF (LIT) which holds a wide array of lithium battery manufacturers and producers. It is trading a relatively low PE of 19 yet the sector may be poised for amazing growth over the next 3-5 years as demand doubles. Market share for hybrids and pure electric cars may be on the rise. The recent news that electric car maker Tesla (TSLA) is planning to construct the biggest lithium-ion battery plant right here in the USA may be validating our long-term buy and hold investment thesis in the once ignored lithium-ion battery sector. Tesla has announced that they are planning to produce an affordable electric car for the US market within three years. This could create a boom in some of the junior lithium and graphite miners which could come into production right here in North America instead of shipping it from China. This is a huge catalyst for the North American lithium and graphite miners who will be able to supply companies like Tesla who is planning to build the biggest lithium-ion battery factory in the world right here in the Western USA at cheaper costs. Battery manufacturing could be a major area of economic growth over the coming decades for Mexico and the US. Lithium and graphite could be the fuel for vehicles in the 21st century. Similar to the internal combustion engine, lithium-ion batteries could revolutionize transportation over the coming decades and reduce the world's carbon emissions. Tesla has a market cap of $31 billion and may now be on the lookout for some of our lithium and graphite juniors in North America that we have been writing about for many years that are still trading for pennies on the dollar. Most lithium comes from either Chile/Argentina (71%) or Australia (26%). Mostly all of the Australian Lithium goes to China. Keep a close eye on the lithium ETF which has recently corrected to a reasonable valuation. The Wall St. Journal said a source believes that Tesla may choose Reno, Nevada to build a $5 billion battery plant producing half a million electric cars annually as there is a lithium resource nearby. Japanese partners may also be considered as strategic investors. In my opinion, this factory could be a major catalyst and astute investors should begin to realize that the internal combustion engine which replaced the horse may now become increasingly replaced with lithium-ion batteries over the next 3-5 years. Disclosure: I do not own any stocks mentioned in article. Subscribe to my free newsletter to get up to the minute updates on rare earths, uranium, gold and silver.